The theme of the gospel of Matthew is the King and the kingdom. It is the gospel of the kingdom, and a kingdom demands a King. The presentation of the kingdom is seen in Matthew 3:2 (by the King’s forerunner), in Matthew 4:17,23 (by the King Himself), and in Matthew 10:1-7 (by the King’s apostles). Matthew chapters 11-12 are key chapters showing how the leaders of Israel rejected their King, even accusing Him of performing His miracles by the power of Satan. To reject the King was to reject the kingdom. They could not have God’s kingdom without God’s King! These Christ-rejecting men clearly showed that they were not with Christ, and therefore were against Him (Matt. 12:30). Their attitude of rejection is stated in the gospel of Luke, "We will not have this man to reign over us" (Luke 19:14). As a result the kingdom of God (the Messianic kingdom promised in the Old Testament Scriptures) did not immediately appear (Luke 19:11) but was "postponed." Of course, from God’s point of view, Israels rejection of Christ did not take Him by surprise, and God had included this turn of events in His overall plan: "known unto God are all His works from the beginning of the world" (Acts 15:18). The word “postpone” means “to hold back to a later time, to defer, to put off, to defer to a future or later time” (Webster). Dispensationalists teach that the kingdom, which was described and promised by the Old Testament prophets, was announced and offered to Israel at our Lord's first coming. However, due to Israel's rejection of Christ, the kingdom was postponed and awaits future fulfillment. John the Baptist, the Lord Jesus and the disciples all proclaimed this message: "The kingdom of heaven is at hand" (Matt. 3:2; 4:17; 10:7). The expression "at hand" means near. The King Himself had come to earth and the kingdom was so near it was almost here! But one fact must not be forgotten. The kingdom offer was conditional. It was offered on the condition of repentance. The entire church is invited to this Sunday School picnic. Weather Permitting. But this invitation is conditional. It is conditioned on the weather. The invitation poster said, "Weather Permitting." Saturday arrives and there is rain the entire day. People call the church and they get this message, "We are sorry, but due to bad weather the picnic will be postponed and will be held in two weeks, weather permitting." The picnic had to be postponed because the condition for having the picnic (good weather) had not been met. The nation Israel had a wonderful opportunity before them. The long-promised Messiah King had arrived on the scene and the kingdom was announced as being at hand or near. But the people were also told that they needed to repent. Although a minority of Jews did repent and turn to Christ, the great majority did not. The rejection of Christ by the nation Israel and by Israel's leaders is clearly seen in Matthew chapters 11-12. This rejection is tersely summarized in John 1:11---"He came unto His own and His own received Him not." The Lord Jesus Christ came to His own people (Matt. 1:21; 2:6) but the nation Israel did not receive Him as their Messiah, King, and Savior (John 1:11). They wanted a King who could feed and heal their bodies (John 6:26), but cared not for a Savior who could feed and heal their souls and atone for their sins (John 6:58-66) and deliver them from Roman oppression (see Judas). Christ, through His miracles and mighty works, gave unmistakable and undeniable evidence that He was indeed the Messiah, the Son of the living God. Yet the Jews in their unbelief still asked for a sign (John 2:18; Matthew 12:38-40; 13:58; Luke 4:23; 1 Corinthians 1:22). Hundreds of years earlier Isaiah had predicted that the Messiah would perform such miracles (Isaiah 35:5-6; compare what Jesus said to John's disciples in Matthew 11:2-6). But even though the Jews saw His works (Matthew 12:13,22) and had clear proof that He was the Messiah (Matthew 12:23), they still refused to acknowledge who He was. In their wicked unbelief and blasphemy they dared to accuse Christ of performing His miracles by the power of Satan rather than by the Spirit of God (Matthew 12:24-37). Such rejection could only bring the judgment of God (Matthew 12:41-45). The climactic rejection of the Messiah took place when the Jews said to Pilate, "Let Him be crucified" (Matthew 27:21-23). Even worse, they took full responsibility for their actions: "His blood be on us, and on our children" (Matthew 27:25). God indeed held them responsible for what they had done: "Him ye have taken, and by wicked hands have crucified and slain" (Acts 2:23). The Lord, because of His forbearance and long-suffering, did not judge the nation immediately. In fact, God graciously made known the gospel to the Jews first (Romans 1:16; Acts 2:5; 3:26). They should have been the last to hear! In fact, they did not deserve to hear at all. But God in His matchless grace reached out to the nation which had crucified His Son! When Paul entered a city he normally went to the synagogue first, often encountering great resistance to the gospel (Acts 13:44-50; 18:4-6; 28:23-28; compare Romans 11:28). Yet God patiently waited and gave the nation opportunity to repent. When Paul finally appeared in Jerusalem (Acts 21-22) the Jews once again rejected God's message and God's messenger. They tried to kill him, crying, "Away with him" (Acts 21:36; 22:22), even as they had done to the Savior years before (John 19:15). The day of God's long-suffering would come to an end. The Lord Jesus had predicted that a terrible judgment of God would come upon Jerusalem because of their unbelief (Matthew 23:38; 24:2; Luke 21:5-6). About forty years after the crucifixion of Christ this prediction was literally fulfilled. In 70 A.D. the Roman General Titus captured and completely destroyed Jerusalem with great slaughter. Since this time the nation Israel has been without a king, without a prince, without a sacrifice, without a priesthood, and without a temple (Hosea 3:4). For nearly 2000 years the Jewish people have been scattered and persecuted throughout the world. Instead of enjoying God's blessings, they have been under God's curses (see Deuteronomy 28). In the 20th century a remarkable event took place in Jewish history. A nation was reborn! The Hebrew language was revived! Millions of Jews have returned to their homeland. God has providentially been setting the stage for the events which must shortly come to pass. Even though many Israelites now occupy the land, they are there, for the most part, in unbelief. Though a small Christ-rejecting remnant has returned, the majority of Jews are still dispersed throughout the nations of the world. During the Second World War, about one third of all the Jews in the world (six million) perished under German persecution and ruthless slaughter. There is coming another day in which two thirds will die (Zechariah 13:9). Certainly Israel is still under the terrible curse of God (see Deuteronomy 28:15 and following). But a brighter day is coming in which the nation Israel will be delivered, forgiven, and purified (Jeremiah 30:7-9; Romans 11:26-27). At this time the nation will begin to enjoy the millennial blessings of God (Isaiah 33:17-24) which had been promised to them by the mouth of all the prophets. When Christ came the first time, Israel, as a nation, did not repent and the kingdom was postponed. When Christ comes the second time Israel will repent and will receive her Messiah, even as Jesus predicted in Matthew 23:39 (compare Zechariah 12:10-14). Study also Romans chapter 11 which speaks of Israel's wonderful future (see our notes on Romans 11). Many non-dispensationalists object to the idea of a kingdom being postponed. Often the reason for this is that they want to claim for themselves the kingdom that was promised to Israel. They teach that the kingdom is here and now, and that the Church is now participating in the kingdom. In their view, the Church has replaced Israel in God's program. The technical name for this erroneous view is Replacement Theology. (1) When the kingdom is finally restored to Israel, it will be a continuation of the same historical, theocratic, earthly kingdom. The very same tabernacle of David that fell will be restored, not some new, revised, or spiritual version of the kingdom (Acts 1:6; 15:16-18; Amos 9:11; see also Alva McClain's The Greatness of the Kingdom, pp. 147-148). (2) When the kingdom is offered again, God guarantees that Israel will repent and receive her Messiah. In other words, there is no possibility of Israel rejecting Christ the second time, and thus postponing the kingdom yet again. We know this is so a) Based on the sure word of prophecy (Zech. 12:10-13:1); b) Based on the provisions of the New Covenant which assure Israel of a new heart, the Holy Spirit, and thus obedience ("I will cause you to walk in my statutes and ye shall keep my judgments and do them"; compare Ezekiel 36:27). The promised blessings result from this obedience and are guaranteed (Ezek.36:24-28); c) Based on the unconditional nature of the New Covenant (compare the "I will's" of Jeremiah 31:31-34). A King will rule the world from Jerusalem (Isaiah 2:1-4; Jeremiah 23:5-6). Wars will cease and there will be peace throughout the earth (Micah 4:3). People will be healed of diseases and there will be no sickness (Isaiah 33:24; 35:5-6). People will enjoy amazing longevity, with their lifespan being comparable to that of a tree (Isaiah 65:20-22). There will be a drastic change in the nature of animals (Isaiah 11:6-9). It is hard to find a king of Israel more wicked than King Ahab (husband of Jezebel). How surprising it is to find this man, at the end of his life, humbling himself before the Lord (1 Kings 21:27). God had just announced that severe judgment would fall upon the house of Ahab, but when Ahab humbled himself God postponed the judgment. Here is what God said to Elijah about this: "Seest thou how Ahab humbleth himself before Me? Because he humbleth himself before me, I will not bring the evil in his days; but in his son's days will I bring the evil upon his house"(1 Kings 21:29). God postponed His judgment for one generation. In 2 Kings 20:1 God, through the prophet Isaiah, told King Hezekiah that he would die: "Set thine house in order; for thou shalt die, and not live." But Hezekiah prayed to the LORD (verses 2-3) and God responded to this prayer and told Isaiah to return to Hezekiah and give him a different message. This time the LORD said his, "I have heard thy prayer. . . and I will add unto thy days fifteen years" (2 Kings 20:5-6). God postponed Hezekiah's death date by fifteen years! In Joshua chapter 10 we have the remarkable account of the battle between the inhabitants of Gibeon and the Israelites. Joshua knew that the success of the battle would be hindered by nightfall. So he prayed to God that the sun would stand still (Josh. 10:12). God answered the prayer and performed an astronomical miracle which has never since been duplicated (Josh. 10:14). God postponed nightfall: "So the sun stood still in the midst of heaven, and hastened not to go down about a whole day" (Josh. 10:13). When Satan fell into sin (Ezekiel 28:15; Isaiah 14:12-14) he was apparently sentenced to the lake of fire immediately (see Matthew 25:41), but this sentence was not executed until thousands of years later (see Revelation 20:10 which takes place after the millennium). God postponed the execution of Satan's sentence for thousands of years so that He might demonstrate something not only to Satan but to all the angelic hosts. Meanwhile, the great drama of mankind's redemption is played out from Genesis to Revelation. God has promised that Elijah will appear on earth shortly before the Lord Himself returns (Malachi 4:5). A careful study of Matthew 17:10-12 and Matthew 11:14 seems to indicate that if the nation Israel had received Christ at His first coming, then Elijah would have come. (John the Baptist would have been Elijah!?) But the nation rejected Christ and thus the coming of Elijah was postponed for about 2000 years. It may be helpful to note that although the kingdom was genuinely offered to Israel, the rejection of their Messiah was likewise prophesied (Isaiah 53:1-3; Psalm 118:22, etc.). God was not taken by surprise in the way the Jews responded to Christ at His first coming. "Known unto God are all His works from the beginning of the world" (Acts 15:18). With this necessary background, we come to the important chapter of Matthew 13. Perhaps the key verses in understanding the chapter are found in verses 10-11. The disciples asked the Lord why He spoke to the multitudes in parables (never before had the Lord taught in this way to the crowds). Jesus answered, "Because it is given unto you to know the mysteries of the kingdom of heaven, but to them it is not given" (v. 11). The term "mystery," as defined in the N.T., refers to something which has been hidden, kept secret, and not made known to men in previous ages but has now been made manifest and made known and revealed in the N.T. Scriptures (see for example Eph. 3:4-5; Eph. 3:9; Col. 1:26; Rom. 16:26). Here in Matthew 13 we have our Lord’s own definition of what He meant by "mystery": "I will utter things which have been kept secret from the foundation of the world....many prophets and righteous men have desired to see those things which ye see, and have not seen them..." (verses 35, 17). Thus, in this chapter our Lord was teaching His disciples something new--new truth which had never previously been revealed. The truth concerning the kingdom of heaven was clearly revealed in the Old Testament Scriptures, and the Jews understood what the Messianic kingdom would be like. That was the kingdom they were expecting. But in Matthew 13 the Lord was going to present some new truth concerning the kingdom, and He calls it "the mysteries of the kingdom of heaven." Today we are living in a unique period of time—a unique age! We are actually living between the two greatest events of history—the first and second advents of Christ. Christ has come (that’s history); He’s coming again (that’s prophecy). This age between the two comings of Christ is unique. The Old Testament prophets could not really distinguish two comings of Christ. When the Jews read the Scriptures, they could only see one coming. As we read our Bibles today (in this present age) we have the advantage of hindsight - of being better able to see two distinct comings of Christ--one is now history and the other is still prophecy. To show you the difficulty the O.T. prophets must have had in distinguishing the two comings of Christ, read the following passages to see how the two comings of Christ are blended together [Micah 5:2; Isa. 9:6-7; Isa. 61:1-2 (compare Luke 4:18-19); Zech. 9:9-10; Isa. 40:3-5 (compare Matthew 3:3; Mark 1:3); Malachi 3:1-2; 4:5 (compare Mk. 1:2; Matt. 17:3,10-13); Luke 1:31-33]. If you were a Jew living in the year 100 B.C., would you have understood these passages as referring to two separate comings of the Messiah? Today, from our unique perspective, we know that there is a period of time (about two millennia) separating these two comings of Christ. During this time period the King is absent from the earth, at the right hand of His Father in heaven waiting until His enemies are made His footstool (Ps. 110:1). The king is in "exile" or according to Luke 19:12, "he went into a far country". This is also an interesting reason we see the term “kingdom of heaven” used only in Matthew. The mystery form of the kingdom is in place, and the rejected King is in heaven. No other gospel writers use this term “kingdom of heaven” it is unique to Matthew’s gospel. What can we expect during this present age between the two advents of Christ? We find the answer to this question in Matthew 13. If you look at two mountain peaks from a distance, it may appear that there is only one mountain. From your vantage point, it may be difficult to distinguish that there are really two mountains with a valley in between. The Old Testament believer had difficulty distinguishing two separate comings of the Messiah. To him the coming of the Messiah looked like one mountain peak in the distance. He did not realize that there were actually two mountain peaks with a valley of about 2000 years in between. The present age may be described as the time of seed sowing. What should we expect during this present age, between the two comings of Christ? What will the conditions be like? What will happen during this time? Will conditions get better and better? Will all men eventually believe God’s Word and be saved? Will there be a worldwide revival that will sweep over all the nations of the world? Will the King return and find a converted world? Matthew chapter 13 answers these questions. As we shall see, Matthew 13 provides a very accurate description of "professing Christianity" (the whole sphere of Christian profession) during this present age. Today we would call this CHRISTENDOM, which for the most part has turned into an ugly religious system. It is a far cry from God’s plan for His Church or God’s plan for His kingdom. With this introduction, we are now ready to consider the parables themselves. A parable literally denotes a placing beside (the Greek word: paraballo, to throw or lay beside, to compare). It signifies a placing of one thing beside another with a view to comparison. For example, in the first parable, the seed is comparable to the Word of God. Hence, a parable is an earthly story with a heavenly meaning. The parables in Matthew 13 are not difficult to understand. In fact, Jesus even interprets two of them for us! The only requirement is that the student must have ears to hear (Matt. 13:9). Please note that the first four parables were told before the multitudes and the last three were taught privately to only the disciples (verses 1-3, 34, 36). This could also be called “The Parable of the Four Soils.” The period between the two advents of Christ will be a period of seed sowing. The seed is the Word of God (Luke 8:11; compare Matt. 13:19). There will be a worldwide sowing of the Word of God in light of Matthew 13:38 ("the field is the world"). The soils represent four classes of hearers or listeners, thus representing the condition of the human heart (compare Matthew 13:19-"heart" and see Mark 4:15 and Luke 8:12,15). What should we expect from this worldwide sowing of the Word of God? How optimistic should we be? Should we expect a worldwide revival resulting in the conversion of all people? This parable makes it clear that there will not be a worldwide acceptance of the Word. We must not anticipate a universal reception of the truth. The great majority of those who hear will reject the truth. At best, only a minority of those who hear will respond with a good receptive heart (compare Matthew 7:14–“few”). The fault lies not with the seed, nor with the Sower, but with the ground (the human heart). Man is to blame (not God and not the Word of God). According to Matthew 13:37 (which actually pertains to the second parable), it is probably safe to say that the Sower is Christ, the Son of man. Of course, Christ does not do the actual sowing, but He gives this responsibility to men (2 Cor. 5:19-20). He does the sowing, but He uses our hands and our mouths and our feet, etc. We are His representatives, His witnesses, His mouthpieces, etc. He works through us. We are His ambassadors (2 Cor. 5:20). The "wayside" (verse 4) actually refers to a road or a dirt path that has been packed down by travelers. It refers to the hard beaten path. Obviously the seed would lie upon the surface of this hard ground and would not even penetrate the hard soil and thus would never germinate. Such seed would easily become bird feed! Obviously this type of soil would represent the person whose heart is hardened and completely unresponsive! This person is completely unreceptive and unconcerned and blinded by the god of this age (2 Cor. 4:4). Satan takes full advantage of the situation, sending his birds (probably representing the demonic forces) to catch away the seed, lest they "should believe the Word and be saved" (Luke 8:12). Luke 8:12 is an important verse because it shows that Satan knows the true plan of salvation: "believe (the Word) and be saved" (notice there is no mention of "baptism" or the many other things that people try to add to the grace of God). This is a good verse to show even to children to point out the true plan of salvation. The devil knows that if people believe the gospel message they will be saved, and he does all he can to prevent this. Birds are sometimes used as symbols of evil (Jer. 5:26-27 and Rev. 18:2). During this present age (between the two comings of Christ) Satan is very active. Satan is alive and well on Planet Earth! He has a very active ministry, assisted by his demonic hosts. This is not talking about soil with many stones in it or ground covered with many rocks, but it is actually speaking of an area with only a thin layer of soil covering a solid ledge of limestone or bedrock which lies just below the surface (a rock ledge covered with a thin layer of soil). Thus we have a description of someone who does receive the Word, but it is only a surface or shallow (false) type of faith. It’s a shoot without a root, and soon dies! At first the person responds enthusiastically (and with joy), but their response is shallow with no depth and no roots. “In this shallow soil the seed is received, but the growth is but superficial. At first they promise well, but later prove very disappointing. What we have here is lack of depth. The emotions have been moved, but the conscience has not been searched; there is a natural ‘joy’ but no deep conviction or true repentance” (A. W. Pink, The Prophetic Parables of Matthew 13). Before long such superficial “believers” fall away and apostatize (depart from the faith). They are professing but then defecting. They start but they don’t finish. When the storms of life come they are blown away because they have no roots. They believe for a time, but it is only a superficial, temporary belief, and before too long they do not believe at all ("a wicked heart of unbelief in departing from the living God"–Heb. 3:12). Here we have seed that is choked by weeds. These weeds deprive the good seed and the young plant of its needed light and moisture. This then is the divided heart, divided between God and the world, between God and mammon (riches). The person is preoccupied with the things of this world (the less important things). His life is dominated by worldly things rather than by God and His Word. Matthew 13 mentions the care (anxiety) of this age and the deceitfulness of riches (verse 22). Mark and Luke give some other thorns: "the lust of other things" (Mark 4:19) and "the pleasures of this life" (Luke 8:14). These thorns crowd out God. There is no room for Him. The students need to see the vanity of things of this world in light of eternity. See the chapter on “Vanity Fair” in The Pilgrim’s Progress. The believer also needs to be alert to the dangers of worldliness: “Anything that dims my vision of Christ, or takes away my taste for Bible study, or cramps my prayer life, or makes Christian work difficult is wrong for me and as a Christian I must turn from it” (David Nettleton). If you love the world, how can you love God (1 John 2:15-17)? God does not want any competition. He wants all of your devotion. He’s a very jealous God! Here is the soil that has been plowed, harrowed and made ready for planting (symbolic of the work of the Holy Spirit in breaking up the hard hearts of men and preparing the soil). It speaks of a heart broken up by the Spirit of God and watered by prayer. Notice what we are told about fruit. In a true believer, we ought to look for fruit. Some believers are more fruitful than others (there is a big difference between 30 bushels of apples and 100 bushels), but there should be some fruit. Matthew 13:23 does not say, “...who also beareth fruit, and bringeth forth, some an hundredfold, some sixty, some thirty and some zero.” If someone claims to be an apple tree, I would have every right to say, “Then let me see your apples!” If the Spirit of God truly lives in us, then where is the fruit of the Spirit (Gal. 5:22-23)? Should not His working be evident? This first parable has some good applications for the Christian believer who is responsible under Christ to sow the seed. We must sow the seed and leave the results up to God. God must bring forth the increase (1 Cor. 3:6). The farmer can only sow the seed and water the soil, but God must do the real work. We should not get disappointed if many do not respond--rather, we should expect this. At the same time, we should expect that some seed (even if it be a very small proportion) will fall upon good ground and will bring forth fruit. What are different ways in which we can sow the seed? God commands us to sow the seed (Mark 16:15; compare 2 Cor. 5:18-20). We need to learn to faithfully sow the seed and leave the results to God. Only God can bring forth life and give the increase! This second parable, as was the first, is interpreted by the Lord (verses 37-43), so there can be no misunderstanding as to its meaning. A correct understanding of the first two parables in Matthew 13 will help in correctly interpreting the others which the Lord did not explain. In this second parable we have two seeds (representing the children of the kingdom and the children of the wicked one) and two sowers (representing Christ and the devil). In the first parable we learned that the great majority of people who hear the word in this present age will not accept it. In this second parable we learn something else about the condition of this present age. There will be a mixture of true believers (children of the kingdom) and counterfeit believers (those who profess to be children of the kingdom but who are really children of the devil). Thus there is a mixture of the true followers of Christ and those who merely masquerade as Christians. Notice also that this wheat and tare mixture will continue until the end (consummation) of the age (verse 39--i.e. until the second coming of Christ to this earth). What are these tares? The Greek word is zizania and it most probably refers to darnel, which is a type of degenerate wheat. It is actually a weed which looks exactly like wheat in its young stages. Only the expert can distinguish some species of this darnel from the true wheat. Later on, the differences are remarkable (cf. verses 26-27). One side effect of the darnel seed is that it is subject to a parasite fungus which infects the seed and is poisonous to both men and beasts. Thus, if darnel seeds have been infected by this fungus, then when the seeds are ground to flour they will be poisonous. As harvest approaches, the wheat grows heavy and bends over more and more, but the tares or darnel are so light headed that they stand very straight. At harvest time the farmer cuts the heads off the tares and puts them in a pile until he has harvested the wheat; then the tares are burned. Satan is the master imitator and counterfeiter! In John 8:39,41 we see the religious hypocrites playing the part of the children of God, but Jesus knew their true identity (John 8:44). They were tares! Satan’s masterpiece is not that minister in the church of Satan who tells everyone that he is a worshiper of the devil. No, Satan’s masterpiece is that highly respected and highly polished Christian minister who seems like such a nice gentleman and who impresses people with his prayers and who is very upright morally. Yet this man never preaches the true gospel of the grace of God; he fails to warn people about the judgment of God and he never speaks about the subject of hell or eternal punishment. He masquerades and disguises himself as a “minister of righteousness” when in reality he is a tool of Satan (see 2 Cor. 11:13). Satan has an imitation Church. Christ is now building His Church which will include all the saved of this present dispensation, and none who are not members thereof will be saved. The Devil has caricatured this also. Romanism professes itself to be the “spouse of Christ,” and her ministers insist there is no salvation to be found outside of their pale. They profess the name of Christ, and hold some of the great fundamentals of His teaching. But artfully mingled with these are the deadly errors of paganism. But so clever is the imitation! (A. W. Pink, The Prophetic Parables of Matthew 13). Today wheat and tares grow together under the all-inclusive banner of Christendom! The students should be asked this question: How can I tell if I am a true believer? Not everyone who professes Christ truly possesses Christ. Not everyone who says he is a Christian is truly a Christian. Compare Matthew 7:21- 23. God does not judge the tares now; He waits until the harvest. At that time they must be judged, because no counterfeit believers will be allowed to enter the kingdom. Note that the field is the world (verse 38), not the Church. Some have misused and abused this parable by saying that we should never exercise church discipline (let the wicked church members continue in the assembly because God will take care of them in the end). Of course this is contrary to all the teaching found in the epistles on the subject of church discipline (compare 1 Cor. 5, etc.). The field is the world, not the church. We cannot keep the world pure from these kinds of people, but we can certainly do everything within our power to keep the church as pure as possible and free from immorality and doctrinal error. Church leaders cannot remove those with doctrinal or moral problems from the world, but they can excommunicate them from the local assembly, when the Word of God calls for such action. The evil ones, represented by the tares, will be excluded from the kingdom and they will be punished eternally (verses 40-41). The righteous will be received and welcomed into the kingdom (verse 43). The common but false interpretation of this parable is that the mustard tree symbolizes the successful growth of the true church from its small beginning in the first century until the end of the age. It is assumed to show the amazing spread of true Christianity and the amazing success of the gospel. The growing church will someday flood the entire world, or so we are told. However, such an interpretation carries with it great problems. It is contrary to the message of the first two parables where we saw that the world will not be very receptive to the message of the gospel and that the evil tares will be mixed with the wheat to the very end of the age. Also it is contrary to church history which does not show an enormous growth of true Christianity. True believers have always been hated and persecuted. True Christians have always been in the minority and the amazing growth has always been in connection with the great religious systems such as Roman Catholicism (and that kind of growth is not something to be proud about!). Certainly today the world is not dominated by Christianity, and even among those who claim to be Christians, there may be many who have never been born again. They are Christians in name only. We must admit, however, that the interpretation of this parable and the following parables is a little more difficult because the Lord does not supply us with the interpretation. Yet, we can assume that there is some degree of consistency between all seven of the parables in this chapter. With that assumption, let us proceed. The mustard seed normally produces a herb (more like a bush), not a tree (verse 32). The Bible makes a clear distinction between herbs and trees (Gen. 1:11-12). But in this parable, we have a mustard seed apparently becoming much more than a great herb; it becomes a huge tree. An actual mustard plant as found in Palestine may, under favorable conditions, reach as high as ten feet (as high as a basketball hoop). At the very most it might reach fifteen feet, but it rarely gets that tall. The Black Mustard plant may grow to a height of fifteen feet and have a thick main stem, with branches strong enough to bear the weight of a bird. This illustrates the difference between a herb and a tree. Tree branches have no problem supporting the weight of a bird. Indeed, a good sized tree can comfortably allow a hundred vultures to roost on its sturdy and sizable branches. No mustard plant could do this! In the Lord’s parable we have a very unusual mustard plant! Jesus said that this mustard plant became a tree (verse 32). Luke says that it became a great tree (13:19) and Mark says it had great branches (4:32). One authority said this: “the mustard plant does not get too big and it certainly doesn’t become a great tree, so we can’t really take the verse in Luke too seriously when it says it became a great tree.” But this is the whole point of the parable! Jesus said that a tiny seed was planted and it grew and became a tree, even a great tree with great branches. If you ever came across a mustard plant like the one described here, it would immediately qualify for the Guinness World Book of Records! An herb growing into a tree is something unknown in the natural world. This is something unusual and abnormal and unnatural. This is a freak, an abnormality, a monstrosity! This is not natural, healthy growth; this is freakish, perverted growth. This is a perfect description of Christendom with its false greatness, ecumenism, influence, wealth, etc. It is the devil’s system that is flourishing! That which Christ here describes is a monstrosity. “Herbs” are an entirely different species from trees. That which distinguished them is that their stems never develop woody tissue, but live only long enough for the development of flowers and seeds. But this “herb” became a “tree”; that is to say, it developed into something entirely foreign to its very nature and constitution” (A. W. Pink). Christianity had very small beginnings (only 120 disciples were gathered together on the Day of Pentecost), but then the number of believers greatly multiplied. During the first three centuries the believers faced fierce persecution from the Romans, but in spite of that the Church continued to grow and Christianity spread. “The blood of the martyrs was the seed of the church.” But in the days of the Emperor Constantine, at the beginning of the fourth century A.D., things began to change. The church became wedded to the world. When Satan discovered that he could not destroy Christianity, he tried a much more successful strategy: “If you can’t beat it, join it!” Constantine declared that Christianity was the official religion and the persecution ceased. Thousands of unsaved people were baptized even though their hearts had not been changed by God’s grace. Pagan idols were given Christian names and worshiped. Christianity began to develop into a large and wealthy religious system, embracing much false doctrine, and it turned into a monster! Christendom today is the resting place for evil men under demonic influences (1 Tim. 4:1), the roosting places for those who are the enemies of God. If we are consistent, then the birds should be agents of evil, as they were in the first parable. Also the tree corresponds very well to the tree described in Daniel 4:20-22 and Rev. 18:2,8 (the latter passage refers to Babylon, the final stage of this monster mustard tree). He believes in Christ as the only way of salvation. The true believer who is part of the true church believes in Christ only, not Mary, not the Pope, not human priests, not the saints, but Christ only. He is the only way (John 14:6; Acts 4:12). He believes in the Bible as the only infallible authority. His faith is not in church tradition, nor in apocryphal books, nor in the decisions of church councils, nor in what priests might teach, nor in what the Pope says, nor in what the church fathers wrote. His faith is in the Bible only (Matthew 4:4; 2 Tim. 3:16-17). He believes in grace as the only means of salvation. He believes that salvation is not by sacraments, not by baptism, not by formalism, not by ritualism, not by confessions, not by indulgences, not by prayers, not by observing the mass, not by giving money to the poor, but by grace alone (Acts 15:11; Eph. 2:8-9). He believes in faith alone. Salvation is not by man’s good works, not by man’s good deeds, not by man’s strivings to keep the law, not by man’s feeble attempts to live a righteous life, not by man’s good deeds, not by man’s religious performances, not by man’s self effort, but by faith alone (Rom. 3:28; Gal. 2:16). This monstrous religious system, in all of its different forms, professes to be Christian but does not believe in Christ only, the Bible only, grace only and faith only! It has rejected the true and only gospel (the good news)! How did the early church grow into something very different from what God intended it to be? How did the church gradually turn away from the teachings of the Bible? Did Paul predict that this would happen (Acts 20:28-31)? Here is another parable that has been traditionally misinterpreted. This leaven is often taken to be a symbol of good. Interpreters say that the leaven of the gospel will permeate and pervade the entire human race until all humanity is converted. The growth of the kingdom will take place because of the penetrating power of the gospel. But here again, this is contrary to the history of the past 2000 years and contrary to the teaching of the first three parables. The leaven of the Sadducees (Matthew 16:6-12) involves a denial of the supernatural (humanistic materialism). Compare Acts 23:8. The Sadducees were not as numerous as the Pharisees but in many ways they were more powerful. They controlled the temple, the priesthood and the Sanhedrin (the council or ruling body of the Jews consisting of 70 members, most of whom were Sadducees). When the gospel accounts mention the "chief priests," this usually refers to the Sadducees. The Sadducees were not nearly as popular as the Pharisees in the eyes of the common people. They were less patriotic and more favorable to Rome. They were more concerned about pleasing Rome than pleasing God. The Sadducees were in many ways unorthodox in their beliefs. They did not believe in angels and they did not believe in a future resurrection of the body. They also believed that souls die with their bodies. This is a denial of the immortality of the soul. Also they did not believe in hell or eternal punishment. The leaven of the Corinthians (1 Cor. 5) involved one of the worst kinds of immorality. The leaven of the Galatians (Gal. 5:9) involved legalism which is the deadly error that teaches that justification or salvation is by the works of the law. The legalists of Judaea said it this way, "Except ye be circumcised after the manner of Moses, ye cannot be saved" (Acts 15:1). Paul clearly confronted this error in Galatians 2:16--"Knowing that a man is not justified by the works of the law, but by the faith of Jesus Christ, even we have believed in Jesus Christ, that we might be justified by the faith of Christ, and not by the works of the law: for by the works of the law shall no flesh be justified." The law can show us how unjust we are (Rom. 3:20b) and thus it can show us our need for justification, but the law can never justify: "Therefore by the deeds of the law there shall no flesh be justified in His sight" (Rom. 3:20). "If righteousness come by the law, then Christ is dead in vain" (Gal. 2:21). The law cannot justify; neither can it sanctify. The law can show us that we are unholy but it can never make us holy. The key to living the Christian life is not found at Mount Sinai, but it is found at Mount Calvary (Romans 6; Gal. 2:20). Paul argued strongly that the Christian life must be continued on the basis of faith, not on a legal basis: "This only would I learn of you, Received ye the Spirit by the works of the law, or by the hearing of faith? Are ye so foolish? having begun in the Spirit, are ye now made perfect by the flesh?"(Gal. 3:2-3) The Christian life is to continue just as it commenced! "As ye have therefore received Christ Jesus the Lord, so walk ye in Him"
(Colossians 2:6). Holiness does not come by seeking to keep the law in the energy of the flesh. C. H. Mackintosh defined legality as "the flesh attempting to carry out the precepts of God." How successful is the flesh? "For I know that in me (that is, in my flesh,) dwelleth no good thing: for to will is present with me; but how to perform that which is good I find not" (Rom. 7:18; see verse 24). In this present age we should expect to find the professing church corrupted with hypocrisy, liberalism, worldliness, immorality, legalism, etc. This is exactly what we find! The Lord went into the house with His disciples where He explained to them the meaning of the parable of the wheat and tares and then told them the last three parables, including the parable of the hidden treasure (Matthew 13:36 and following). This parable has been traditionally interpreted as follows: The treasure represents Christ (or salvation). The man represents the sinner who is seeking Christ. The man sells all that he has to obtain the treasure. The common interpretation is that the man forsakes everything so that he can follow Christ. “(Salvation) is a treasure so inestimably precious that one who obtains it is willing to surrender for it whatever could interfere with having it” (Hendricksen). The problems with such an interpretation are obvious. Christ is not hidden in the world, nor is He for sale. And once the sinner finds Christ, he does not hide Him! It is not really the sinner who seeks Christ (Rom. 3:11); but Christ who seeks the sinner (Luke 19:10). The sinner has nothing to offer Christ and the sinner cannot purchase salvation. Salvation is totally free (Rom. 6:23; compare Isaiah 55:1). Salvation was purchased by the Savior (1 Pet. 1:18-19), not by the sinner. The sinner is bankrupt. He has nothing to offer God and nothing to give to God. “Nothing in my hands I bring, simply to Thy cross I cling.” Also this traditional interpretation is not consistent with the other parables. In the other parables, the man represents Christ, not the sinner. The correct interpretation is that the man is Christ and the treasure is the nation Israel (see Exodus 19:5; Psalm 135:4; compare Deut. 14:2). Israel was lost (Matt. 10:5-6) but Christ came to find it! Notice that Christ bought the entire field (representing the entire world—v.38) so that He could have Israel as a special possession. This seems to be a reference to unlimited atonement: Christ died for the whole world (2 Pet. 2:1; 1 John 2:2; John 1:29; etc. ), in which is His special treasure. Today Israel is hidden in the world. They are scattered throughout the world and often are persecuted and afflicted; yet in God’s sight the nation is precious. When the King returns, the nation Israel will be given its prominent place in the kingdom and all the world will know that God has a precious treasure, namely Israel. But meanwhile, during this present age between the two comings of Christ, Israel is hidden in the world. "I’ve found the pearl of greatest price! And sing I must, for Christ is mine! Christ shall my song employ." A. W. Pink sets forth the popular interpretation of this parable (which he does not agree with): Christianity is likened unto one who earnestly desired and diligently sought salvation. Ultimately his efforts were rewarded by his finding Christ, the Pearl of great price. Having found Him, as presented in the Gospel, the sinner sold all that he had: that is to say, he forsook all that the flesh held dear, he abandoned his worldly companions, he surrendered his will, he dedicated his life to God; and in that way, secured his salvation. The problem with this view is that the sinner does not seek God (Rom. 3:11) but it is God, in the Person of Christ who seeks the sinner (Luke 19:10). Also the sinner cannot purchase salvation because salvation is the free gift of God (Eph. 2:8; Isaiah 55:1). And a gift cannot be sold or bartered! The correct interpretation, as in the previous parable, sees the man as Christ. Who then does the pearl represent? The pearl represents the true church. The pearl is not listed among the Jewish precious stones. It is never mentioned in the Old Testament (see the list of precious stones in Exodus 28:17-20 and Ezekiel 28:13; etc.). The pearl is found on the inside of an oyster, a living organism. Thus a pearl is a product of a living organism (such cannot be said of any other gemstone). A grain of sand or some kind of foreign substance finds its way into the opening of the oyster. It is at once an irritant and becomes an annoyance to the oyster. It really bothers and disturbs him. To get relief the oyster throws off a secretion (a slimy substance called “nacre”) which forms around the irritant. This process is repeated again and again, and eventually forms a pearl. Thus the pearl forms slowly and gradually, layer upon layer of secretion. Consider also the unity of the pearl--it is always one pearl. Thus it is a fitting symbol of the Church which is so precious to the Savior that He gave Himself for it. The Church is a living organism, a body that is pulsating with the very life of God (1 Corinthians chapter 12). Just as a pearl forms gradually, so God is gradually adding to His Church daily those who should be saved (Acts 2:41; 5:14). During this present church age, the Spirit of God is forming this precious pearl, for by one Spirit are all believers baptized (placed) into one body (1 Cor. 12:13). The man sold all that he had. The traditional interpretation sees the sinner as giving up anything and everything to find Christ; but it is really Christ, not the sinner who made the great sacrifice that resulted in salvation. How poor did Christ become in order to purchase this pearl? See 2 Cor. 8:9 and Philippians 2:5-8; etc. May we never forget that we are bought with a great price (1 Cor. 6:19-20). Pearls are to be exhibited! Thus, Christ will exhibit and show off His pearl in the ages to come (Eph. 2:7). This last parable is similar in many ways to the parable of the wheat and tares. Both show the good and the bad mixed together until the judgment. At that time there will be a separation of the true and the false, and only the righteous will enter the kingdom (though in this present age both the good and the bad are allowed to remain). The only thing that will really cleanse this world and prepare it for the kingdom is the sweeping judgment of God. The net described in this parable was a very large net, weighted below with corks on top and sweeping perhaps a half mile of water, catching everything in its path, including desirable fish and undesirable creatures. Prior to this the good and the bad creatures were allowed to swim together in the water, just as the wheat and the tares were allowed to grow together. However, after they are caught in the net a separation will take place (just as there will be a separation of the wheat and tares). Do not confuse this net with the small net that a fisherman would throw from the shore and then pull in by hand. No, this was a large fishing net known as a dragnet. There is a Latin word which describes this net as “a sweep net.” It sweeps the sea for anything and everything. Sometimes this giant net would be tied between the two boats. The boats would circle out and make a wide sweep, dragging the net behind, usually resulting in a large catch of fish and whatever other creatures might have been in the path of the net. There was another way that the dragnet was used. Fishermen on the beach held one end of the net and the other end of the net was in a boat which would circle around making a wide sweep. As the boat would swing back in, they would grab the other end of the net and the men on the beach would pull the net in from both ends and the contents would be dragged to the shore. The dragnet was indiscriminate in what it caught. It played no favorites. It did not say, “I will only catch tuna fish.” No, it took everything in its path. Everything was picked up, whatever happened to be in the path of the net, whether good or bad, desirable or undesirable. The kingdom of heaven is like a great dragnet; the net is thrown into the sea and when it is pulled together it brings in everything in its path. Nothing escapes. Everything in the water is collected. At the end of the age, every human on earth will be gathered together and then separated into two groups. “Which, when it was full, they drew to shore, and sat down, and gathered the good into vessels, but cast the bad away” (Matthew 13:48). When the net was full they drew it to the shoreline. Just as Joseph was dragged up from the pit he had been thrown into (the same word is used in Genesis 37:28, LXX), so also the net full of fish was dragged to shore. The fishermen closed the net and brought the net in and then they sat down to sort out the contents. The word “gathered” is the main verb and it means to gather or to collect. They collected all the fish. This gathering involved a drawing in of the fish followed by a sorting of the fish, the good being put into containers. The same word “gather” was used earlier of the tares: “Wilt thou then that we go and gather them up?” (Matthew 13:28). “But he said, Nay; lest while ye gather up the tares, ye root up also the wheat with them” (Matt. 13:29). If they were to gather the tares they would destroy the wheat. Thus the time to gather tares and the wheat was at harvest time and not before (see Matt. 13:30). Only then can things be sorted out properly. The good fish were gathered into vessels and the bad were cast away. The word “good” (kalos) involves that which appears good to the senses, that which is perceived to be good. The fisherman could examine and see the fish with his eyes and determine which ones were good and worth keeping. This same word for “good” is used elsewhere in this chapter: “good ground” (verses 8, 23), “good seed” (verses 24, 27,37,38). The good fish were placed into vessels. The word “vessel” means a basin, a container, a bucket. Only the good fish were kept. They put the good fish into the baskets or containers, but they threw away the bad which included anything that they could not eat or use. The bad was collected in the net because the net brought up everything that happened to be in the sea where the sweep was made. So too, at the end of the age the Judge of all the earth will collect and gather together all humanity—good and bad, rich and poor, young and old, males and females. They are all in God’s net. No one escapes. The bad were cast away. The term “bad” (sapros) refers to something that is corrupt, rotten, decayed, worthless, having no value. It comes from a word meaning “to rot.” They cast away that which was rotten, worthless, corrupt. “Even so every good tree bringeth forth good fruit; but a corrupt (rotten, worthless) tree bringeth forth evil fruit” (Matthew 7:17). “A good tree cannot bring forth evil fruit, neither can a corrupt tree bring forth good fruit” (Matthew 7:18). “Either make the tree good, and his fruit good; or else make the tree corrupt (rotten, worthless), and his fruit corrupt: for the tree is known by his fruit”(Matthew 12:33). What is found in the net is either good or it is corrupt. It is one or the other. It is not halfway. It is either going to be thrown away or it will be saved. So it is with salvation. You are either in or out. You have either received Christ or you have not (John 1:12). You have either entered through the door (John 10:9) or you have not. You are either clothed in Christ’s righteousness or you are not. A person cannot be “half-saved,” nor can one be “half-forgiven.” You cannot have half your sins forgiven and the other half not forgiven. You cannot have half eternal life and half eternal death. You cannot be half in heaven and half in the lake of fire! The good news is that it is still possible for corrupt sinners to come to Christ and be saved. Those who do so will never be cast out (John 6:37). But once in the net, it will be impossible for the corrupt to become good. The person’s destiny will have been sealed (see Rev. 22:11). They put the good fish into containers or buckets but the bad and worthless they threw away. What does this all mean? “So shall it be at the end of the world (age): the angels shall come forth, and sever the wicked from among the just (righteous)” (Matthew 13:49). 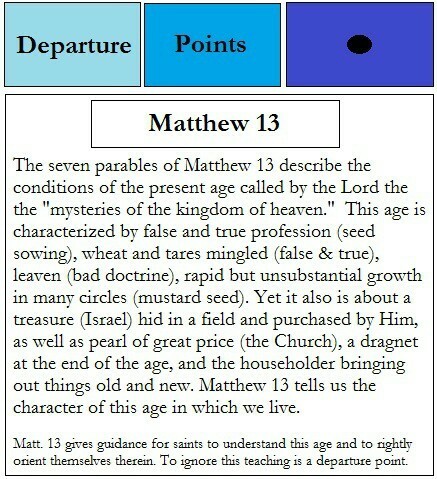 This is the third parable in Matthew 13 which the Lord explained and gave the interpretation. The other two were the parable of the Sower (verses 18-23) and the parable of the wheat and tares (verses 36-43). There is no question about what the parable of the dragnet means because the Lord interprets it for us in very clear language. The net is dragged through the sea of the world. In Scripture the “sea” often represents the Gentiles or the nations of the world (see Rev. 17:15). The net brings in everything in the world and it gathers both the good and the bad. The “end of the age” means the completion of the age. This present age will end with the second coming of Christ to this earth (following the seven year tribulation). The fish gathered in the net do not represent all humans that have ever lived. This net does not sweep the sea throughout all of human history. No, the ones gathered are only those who are “in the sea” at the end of the age, at the time of harvest. It only includes people who are alive on Planet Earth at one point in history, namely at the completion of this present age. It is the same event that the Lord already described as “the harvest” (v. 39). Note how the term “end of the age” is used elsewhere in Matthew: 13:40; 24:3; 28:20. According to Matthew 24:3, the end of the age will be marked by the coming of the Son of Man. This present age will end at the close of the tribulation period (Daniel’s 70th week). The coming of Christ the King will mark the completion of the age. So shall it be at the end of the world (age): the angels shall come forth, and sever the wicked from among the just” (Matthew 13:49). The ones who will do the separating are the angels. The angels will come forth or come out. They will step forth out of heaven into this world. The angels have an assignment. They will function as harvesters. Their assignment is to sever or separate the wicked from among the just (righteous). This is the opposite of what happens at the rapture which takes place seven years earlier (1 Thess. 4:13-18). At the rapture the righteous (saved) are removed and taken from the earth, but at the harvest it is the unsaved who are removed and taken from the earth (in judgment). See Matthew 24:37-41 and notice the comparison with the days of Noah. In Noah’s day it was the unsaved people who were removed from the earth by means of the judgment of the flood and it was the saved people who were left on the earth (Noah and his family) to repopulate the world. See also Luke 17:34- 37 where those taken (at the end of the age, at the harvest) are clearly taken in judgment (vultures, etc. and compare Rev. 19:17-18). At the rapture the wicked are left on the earth to enter the tribulation but at the harvest it is the saved people who are left on the earth to enter the kingdom and re-populate the earth. At the rapture the ones who are gathered are the saved people (2 Thess. 2:1) as the Lord gathers together His bride and receives the church unto Himself (John 14:1-3). The unsaved are not gathered but are just left on the earth. At the harvest the unsaved are gathered first (“gather first the tares”–Matt. 13:30; compare v. 41) and the saved people are also gathered (Matthew 24:31). At the rapture it is the saved who are taken out from the unsaved; at the harvest it is the unsaved who are taken out from the saved (compare Matthew 13:49—the wicked are taken out and separated from among the righteous and see also verse 41). According to Matthew 13:29-30 the wheat and tares were both to grow together until the harvest. We know, however, that at least seven years prior to the harvest the rapture takes place and all the believers (those who are truly saved) are removed from the earth. The rapture takes place because of the grace of God, not because of man’s worthiness. However, prior to the rapture there is a religious system in place, a great ecumenical system of churches, etc. which in many ways have “a form of godliness.” When the rapture takes place the Roman Catholic Church will remain and continue on into the tribulation, although if there are some in the Roman Catholic church who are truly trusting Christ as their Savior, then these individuals will be taken in the rapture. The same will be true for other churches (Episcopalian, Congregational, Methodist, etc.). The World Council of Churches is not going to be removed by the rapture. There may be individuals in the WCC who are saved and who will be taken in the rapture, but the WCC will remain. The great mustard tree will continue on. A whole host of people professing to be Christians will miss out on the rapture and will enter the tribulation. If these individuals do not get saved then they will be part of a huge apostate world church during the first half of the tribulation. It will be very difficult for the public to try to figure out what is right and what is wrong in this great monstrosity. The wheat and the tare scenario continues, even though God took out a crop at the time of the rapture. But the greater harvest will take place seven years later by way of the dragnet. That is when the final separation of saved and unsaved will take place. At the rapture this does not take place. At the rapture people are not separated into two distinct groups (sheep and goats, good and bad fish, etc.). This happens at the end of the age. Immediately following the rapture there will be no saved people on earth, but this situation will not last long. The two witnesses will be saved (Revelation 11) along with the 144,000 witnesses mentioned in Revelation chapter 7. Through their testimony many others will be saved, such as the group mentioned in Revelation 7:9. At the rapture the Lord does not come to earth, but meets the church in the air to receive His bride and then to bring His bride to heaven (John 14:1-3 and 1 Thess. 4:13-18). At the harvest the Lord is on the earth, sitting on a judgment throne (Matthew 25:31). The angels will sever or separate the fish. They will separate that which is in the net, the bad from the good. “And before him shall be gathered all nations: and he shall separate them one from another, as a shepherd divideth his sheep from the goats” (Matthew 25:32). The word “separate” is the word “sever.” The word “divideth” is the same word also. The Lord Jesus Christ, at the judgment of the nations, is going to separate them one from another, as a shepherd separates the sheep from the goats. A severing will take place at the end of the age, with all men being separated into two groups. The angels will be involved in this separation process. The wicked will be separated from the just. “And shall cast them into the furnace of fire: there shall be wailing and gnashing of teeth” (Matthew 13:50). The emphasis is not on the just (righteous) persons but on the wicked, bad persons. He will cast them into the furnace of fire. In that furnace of fire, there shall be wailing and gnashing of teeth. The word “wailing” means to weep, to wail. There will also be the gnashing and grinding of the teeth. It involves striking the teeth together, as in anger, rage, pain or frustration. It describes the condition of the wicked in the future life. Some consider this the eighth parable in the chapter, but it is probably best to consider it as an additional or concluding parable. It must be considered in light of verse 51. The disciples said that they understood all these things (though certainly they did not fully understand all that the Lord was teaching them). See also Mark 4:34 where we are told that the Lord, after giving these parables, expounded all things to His disciples as He met with them privately. The owner of the house has treasures, both new and old. In your house you might have an antique clock worth quite a bit. It is old but it is a treasure and a collector’s item. You also might have a very expensive computer which is brand new. You have some things that are old and some things that are new and there is value to both of them. If you are one of Christ’s disciples (students), then you have been given treasures. You have been given treasures of truth. What are you going to do with these treasures, both old and new? In verse 52, Jesus was in essence saying, "If you have really understood these things, then a new responsibility is yours. You have God’s truth and God’s treasure. You are custodians and stewards of God’s truth. You are responsible to carefully discern between the old and the new (much of this present chapter presented the new). There are great treasures in the Old Testament and great treasures in the New Testament. You have this treasure; now you are responsible to share it and teach it as a faithful scribe. Paul considered himself and other believers as "stewards of the mysteries of God" (1 Cor. 4:1-2) and it is required of a steward that he be found faithful! God’s mysteries are not intended to be concealed; they are to be revealed! They are to be made known. They are to be taught! Christ has made known to us the mysteries of the kingdom of heaven. Now that you have been instructed, you are to take these truths and live them, share them and declare them to others. Sow the seed. Show that you are a true believer and not a Satanic counterfeit. Show the world that you have no part in Satan’s wicked, monstrous religious system. Show the world that you can stay pure regardless of the corrupting influences all around you. Show your respect for the nation Israel, God’s chosen people who have a wonderful future in the plan of God. Show the world that by God’s grace you have been made part of a living organism, not part of a dead organization. You are a part of God’s precious pearl. Warn the world of God’s judgment upon those bad fish, that is, upon those who know not God and obey not the gospel of our Lord Jesus Christ. May God help us to be faithful stewards of the mysteries of God (1 Cor. 4:1-2)!